Peel sweet potatoes and cut into very thin slices. Lightly drizzle olive oil over pizza crust then spread with mascarpone cheese. Sprinkle with garlic salt. 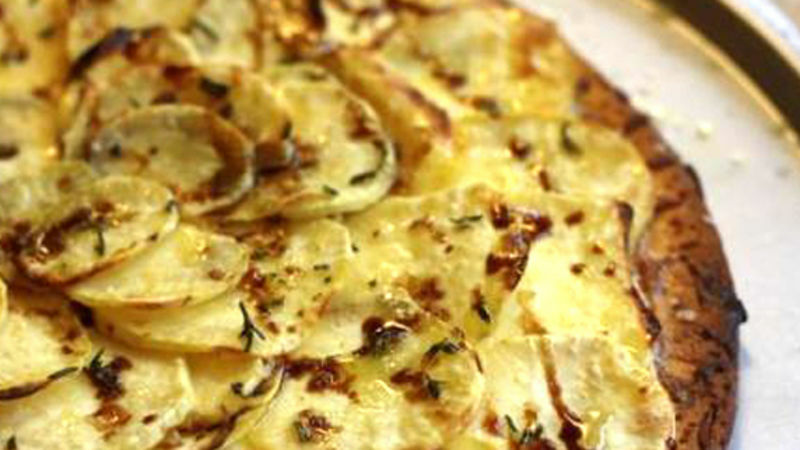 Layer potatoes over the mascarpone and sprinkle with rosemary, thyme, and kosher salt. Drizzle olive oil over entire pizza (about 1 teaspoon). Bake at 425° F for 18-25 minutes, until potatoes are soft and crust is crispy. If you can not find Mascarpone cheese (usually in your grocer deli case), you can substitute 5 oz. cream cheese mixed with 2 tablespoons sour cream. I have one word for this Sweet Potato Pizza...AMAZING! You must try this--I know it sounds unusual but it's the perfect pizza -- a little sweet, a little salty, creamy and crunchy. Heaven! When I first mentioned my idea everyone said, "huh?". After trying it, there were rave reviews all around. My skeptical husband loved it! My super-cute friend Katie stopped by while I was whipping it up and tried a piece. She exclaimed, "I am going to go buy the stuff to make this TONIGHT!" She served it to her husband who also raved about it. So, grab your ingredients and let’s whip up a pizza! Layer potatoes over the mascarpone and sprinkle with rosemary, thyme, and kosher salt. Drizzle olive oil over entire pizza (about 1 Tbsp).